For the Olympic swimming pool BIAD leveraged AECOsim Building Designer’s computational design capabilities for parametric design of the building. By adding algorithms for the structural analysis, BIAD determined the shape and detail of each component. Using this methodology ensured that an optimized design for the interior and exterior, as well as the relational dependencies, would be achieved. 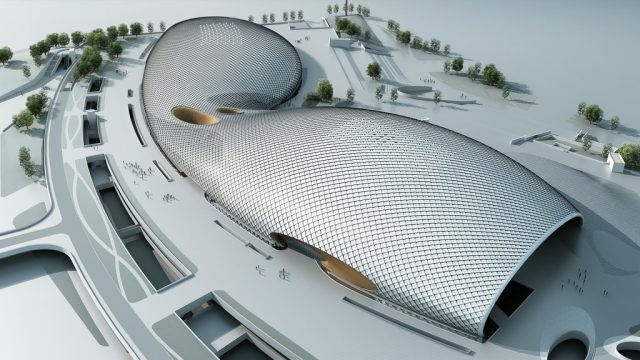 The project team applied a BIM methodology to the structure, curtain walls, rainwater, lighting, ventilation, and underground commercial buildings by using innovative applications and new work processes. Challenging terrain caused by the Qiantang River required careful planning, and BIAD used automated complex modelling techniques in conjunction with parametric design to extract logic for the surface size and shapes. Consistency was needed between the steel structure and the architectural design, all carefully coordinated with the structural load analysis. For this CNY 4.5 billion project, BIAD standardized on a BIM methodology to assemble all the components for the planning and design stages. With enhanced 3D modelling, the team could conform to design standards and ensure integration with the electromechanical systems. The comprehensive BIM models provided accuracy and integrity for all phases of the lifecycle and data consistency ensured validity through all phases of the project. Bentley Navigator supported clash detection and BIM review, ensuring errors were resolved before construction, saving valuable time and resources. ProStructures and STAAD were used for steel structure calculations, reducing design cycle time as well as providing engineering analysis for integrity. ProjectWise created a common data environment, which enabled engineering data to be shared by a distributed team in structured BIM workflows. This interoperable digital workflow provided greater fidelity, flexibility, and transparency for the designers, construction firms, and the owner. By using Bentley’s comprehensive modelling and common data environments, BIAD reduced design time by 60 percent. Moreover, clash detection and pipeline collision testing saved the project team 100 resource days. Can we make small BIMs?